You can upload data files in a) native Excel format or b) CSV format. Clicking on the import arrow in the upper right corner allows you to select the file to upload. Note that you can also drag and drop a file into the dialog box. FrePPLe automatically detects which of the two data formats you’re using. The upload icon will only be available when you have add-permission on the data object you’re uploading. A message is shown when you don’t have this permission. The first line in the data file should contain the field names (not case sensitive). To get a sample of the input format you can first create a export: the format of the export file is such that it can be reread into frePPLe. 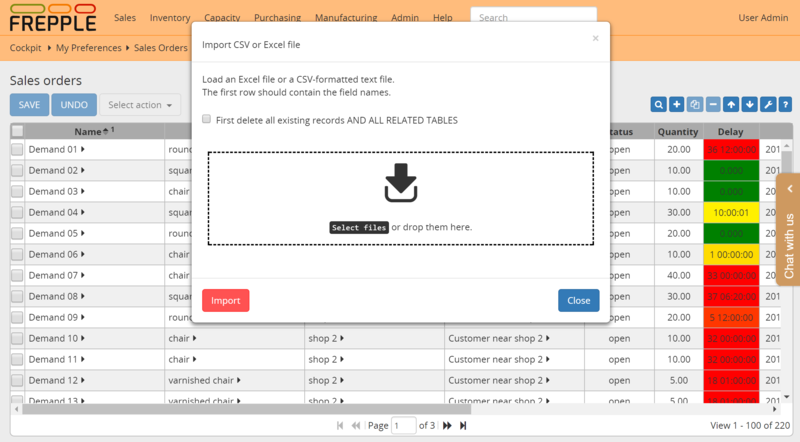 The dialog screen shows a checkbox First delete all existing records AND ALL RELATED TABLES meaning that you can choose to delete the existing contents of the table before uploading the new data. When the option is selected, dependent tables are also erased: e.g. if you select this option when uploading the resource table, also the operationresource table will be erased since the second table references the first one. If you’re not very familiar with the relation between the objects in frePPLe’s data model, you probably shouldn’t use the First delete all existing records AND ALL RELATED TABLES option. After the upload, the number of data rows loaded will be displayed. When data errors were found during the loading process the details will be shown as well. The date format expected by frePPLe is ‘YYYY-MM-DD HH:MM:SS’. The data file is expected to be encoded in the character encoding defined by the setting CSV_CHARSET (default UTF-8). Importing a native Excel file avoids these common pitfalls from the CSV text-files. In the Admin/Execute menu you also have the capability to import multiple tables from a single Excel workbook using the Import a spreadsheet option.